Even as US-China trade tensions intensified, funding costs increased, and China continued its deleveraging campaign, the Asian credit market maintained its status as a low beta market, with year to date volatility at the same levels observed in 2017 (as of September 19, 2018), which were already at decade lows. The relatively low volatility of Asian Investment Grade (Asian IG) is notable, especially when compared to developed markets such as the US investment grade market. Strong fundamentals and technicals, as well as attractive valuations continue to make the Asian IG credit a solid option for a core holding. PineBridge Investments (PineBridge) believes three key reasons anchor the performance and resilience of Asian investment grade credit. The fundamentals of the Asian investment grade credit market remain solid and have been on an improving trend since 2015. 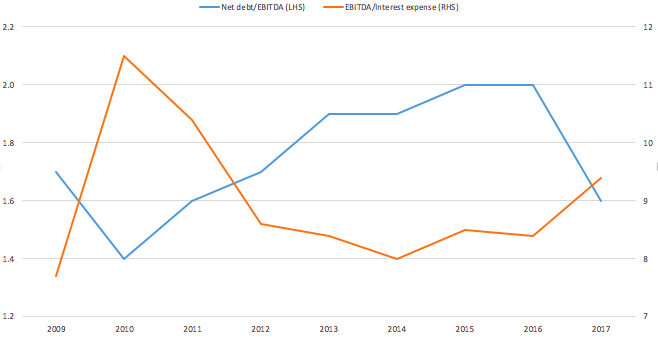 For instance, net debt to earnings before interest, taxes, depreciation and amortisation (EBITDA) has continued its decline to about 1.7 times in 2018, from over 2 times in 2015. Post the 2008 Global Financial Crisis, profitability margins, such as EBITDA margins, have moved to new highs, and interest coverage is strong at 8 to 9 times. On the back of China’s deleveraging campaign, there has been a notable improvement in the state-owned sector, where discipline in cost cutting, mergers and acquisitions (M&A) and capital expenditures are all helping improve credit metrics. This is also the case for Korean issuers, Hong Kong issuers and other countries. The overall improvement in Asian IG fundamentals is also reflected in credit ratings with the rating upgrade/downgrade ratio standing at 4.2 times in 2018 (Moody's, as of September 30, 2018). Source: JP Morgan, PineBridge, as of June 4, 2018. Asian IG currently offers 35 basis points (bps) pick up over developed market IG for the same average credit rating and at 2.3 years shorter duration, which makes Asian IG a diversifier, to the more rate-sensitive developed market (DM) IG. 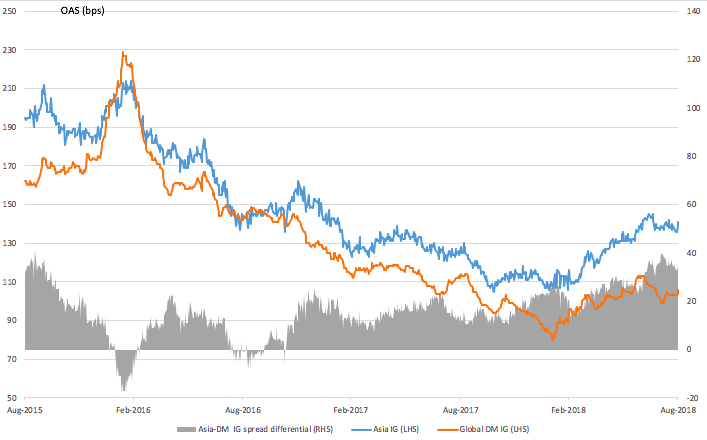 The shorter duration and better spread cushion of Asian IG has also resulted in lower volatility versus DM IG credits. Source: BoAML ICE credit indices, as of August 31, 2018. 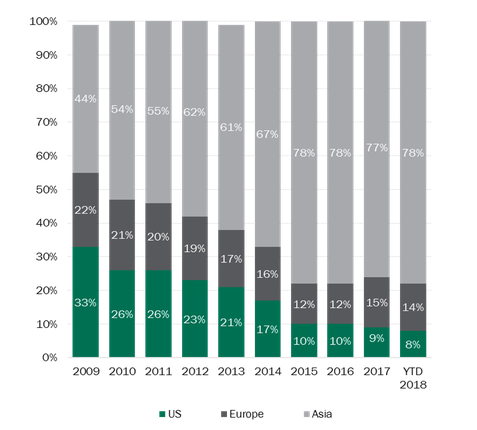 Coming from a very low base, volatility can increase going forward, but it is important to note that this will be mitigated by the fact that Asia has a growing money pool. In the past 10 years, we have seen a consistently higher share of the Asian credit market owned by Asian buyers. Today, Asian buyers dominate the market, which creates an anchoring effect, sheltering the market from fickle or so-called “tourist” investors. Asian investors tend to have a home bias, purchasing issuers they understand and know. Although the region is also a high issuance market, on a net basis, its credit market remains stable. It is also important to mention that global allocation into Asia is expected to increase with time, given the natural increase of Asia’s share in the global economy and indices. Additionally, the Asian investment grade segment has a lower duration profile, making it more defensive for investors concerned about interest rate risk. Looking at the new landscape emerging from the Chinese deleveraging campaign, PineBridge believes Asian IG credit retains its status as a core fixed income holding. Supported by strong and resilient fundamentals, the Asian IG credit segment continues to outperform a large number of its peers. While not without risks, our investment premise favors greater issuer differentiation, being cognisant of the multi-year credit trends emanating from China’s economic transformation, as well as Asia’s continued economic rise. Active issuer selection should help investors continually position their portfolios to take advantage of market shifts. All types of investments and all markets are subject to market volatility based on prevailing economic conditions. Price trends are determined mainly by financial market trends and by the economic development of the issuers, who are themselves affected by the overall situation of the global economy and by the economic and political conditions prevailing in each country. As securities may fluctuate in price, the value of your investment may go up and down. Investments may decline in value and investors should be prepared to sustain a total loss of their investment. The prices of FDI can be highly volatile. In addition, the use of FDI also involves certain special risks depending on the type of FDI, including but not limited to correlation risk, counterparty credit risk, legal risk, settlement risk, margin risk, as well as other possible risks that may arise. Issuers may not be able to make payments of interest or repayment of money borrowed. Changes in interest rates, credit ratings and inflation may lead to a loss in value. A portfolio’s performance is often derived from its allocations to certain countries. These allocations may present greater opportunities and potential for capital appreciation, but may subject the portfolio to higher risks of loss. Emerging markets are typically smaller, less transparent and subject to evolving, less stable political and regulatory regimes. The risk factors described should not be considered an exhaustive list of risks, which potential investors should consider before investing in the Sub-Fund. For more details on the Sub-Fund’s potential risks please read the Prospectus and Key Investor Information Documents at pinebridge.com/funds. Opinions: Any opinions expressed in this document represent the views of the manager, are valid only as of 10 August 2018, and are subject to change without notice. There can be no guarantee that any of the opinions expressed in this document or any underlying position will be maintained at the time of this presentation or thereafter. We are not soliciting or recommending any action based on this material. Despite current challenges, PineBridge Investments’ portfolio manager for global multi-assets Sunny Ng, explains economic fundamentals indicate the outlook for global markets remains constructive. The fund’s AUM has reached $1 billion and offers the features and characteristics of both stocks and bonds.